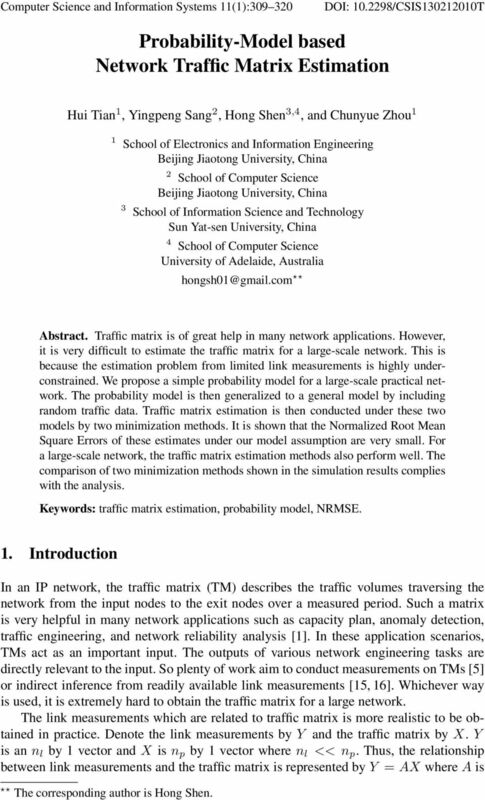 Download "Probability-Model based Network Traffic Matrix Estimation"
1 Computer Science and Information Systems (): DOI: 0.98/CSIS3000T Probability-Model based Network Traffic Matrix Estimation Hui Tian, Yingpeng Sang, Hong Shen 3,4, and Chunyue Zhou School of Electronics and Information Engineering Beijing Jiaotong University, China School of Computer Science Beijing Jiaotong University, China 3 School of Information Science and Technology Sun Yat-sen University, China 4 School of Computer Science University of Adelaide, Australia Abstract. Traffic matrix is of great help in many network applications. 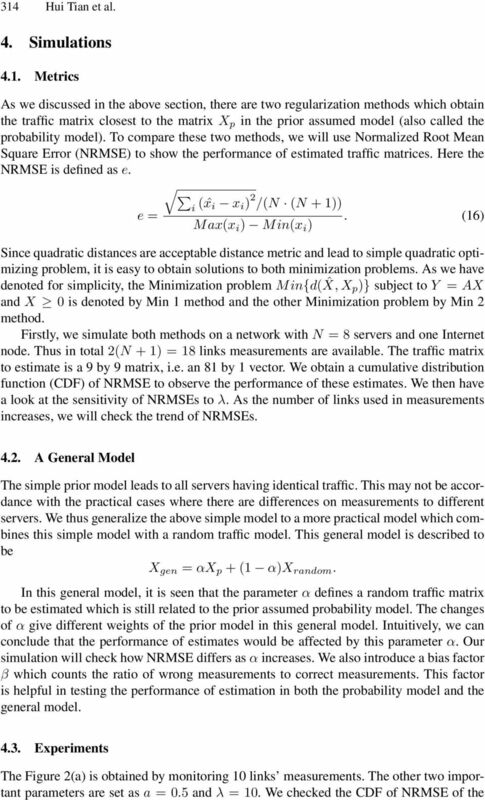 However, it is very difficult to estimate the traffic matrix for a large-scale network. 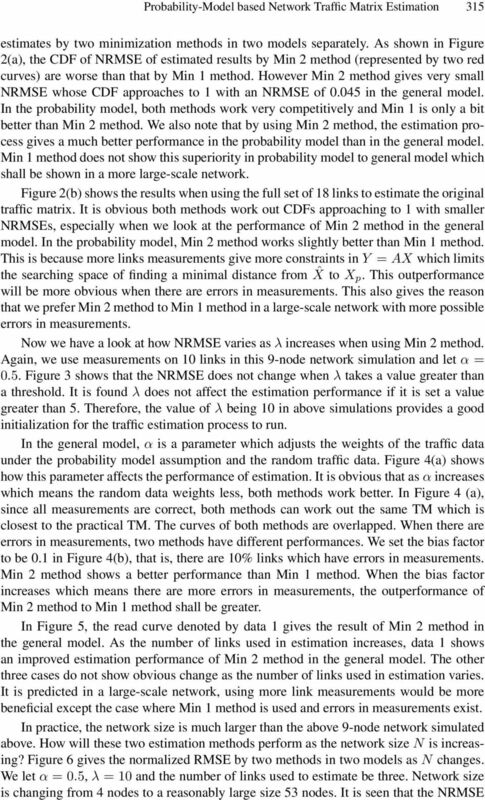 This is because the estimation problem from limited link measurements is highly underconstrained. 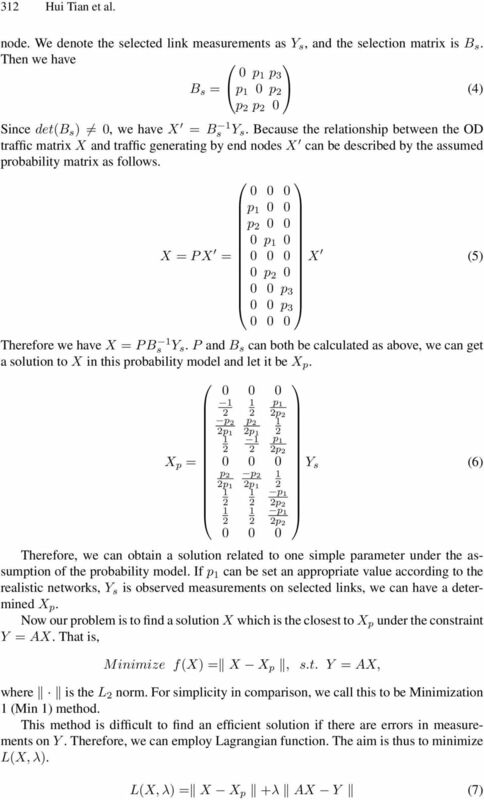 We propose a simple probability model for a large-scale practical network. 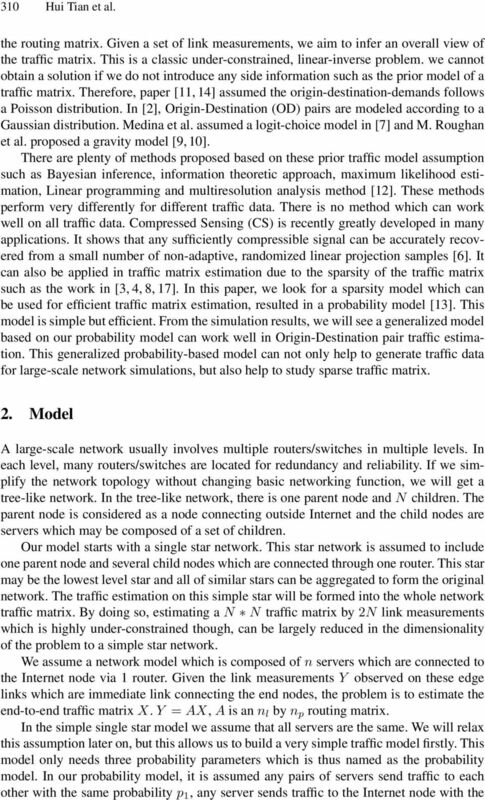 The probability model is then generalized to a general model by including random traffic data. Traffic matrix estimation is then conducted under these two models by two minimization methods. 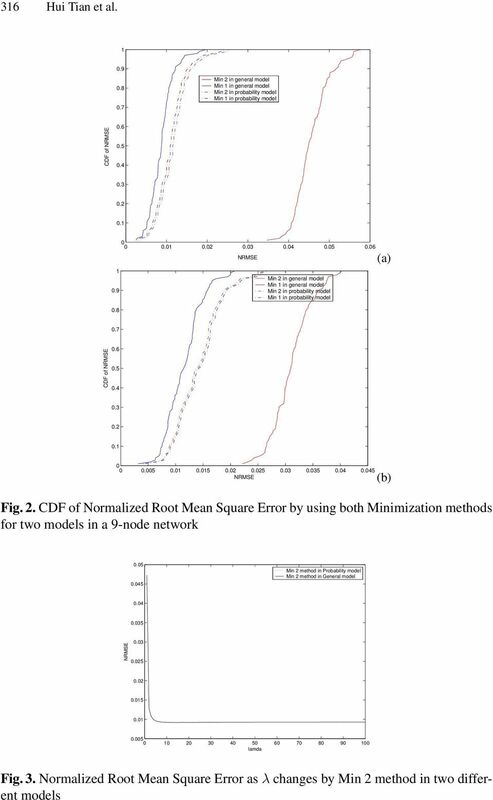 It is shown that the Normalized Root Mean Square Errors of these estimates under our model assumption are very small. 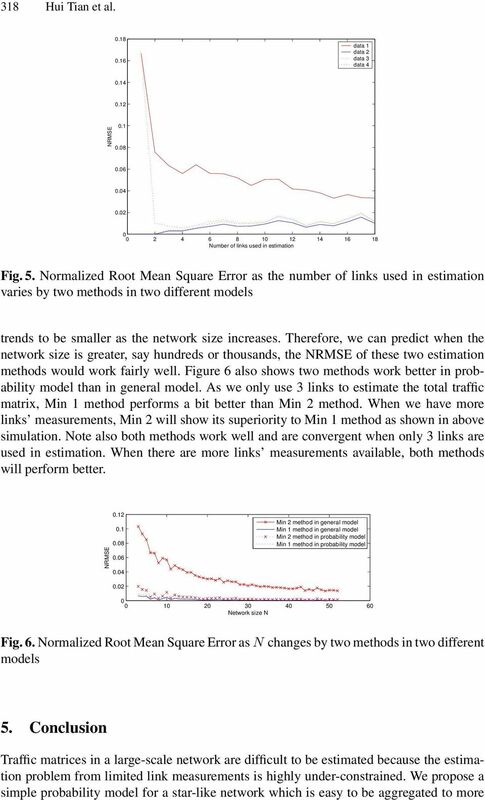 For a large-scale network, the traffic matrix estimation methods also perform well. The comparison of two minimization methods shown in the simulation results complies with the analysis. 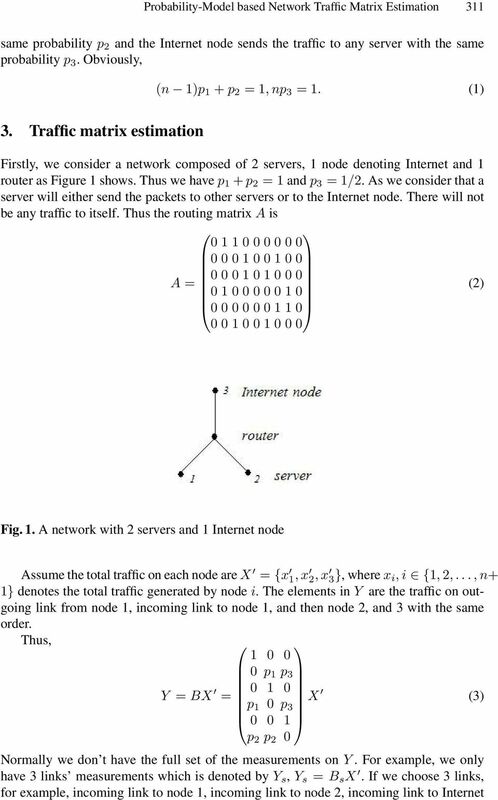 Keywords: traffic matrix estimation, probability model,.. Introduction In an IP network, the traffic matrix (TM) describes the traffic volumes traversing the network from the input nodes to the exit nodes over a measured period. Such a matrix is very helpful in many network applications such as capacity plan, anomaly detection, traffic engineering, and network reliability analysis . In these application scenarios, TMs act as an important input. The outputs of various network engineering tasks are directly relevant to the input. So plenty of work aim to conduct measurements on TMs  or indirect inference from readily available link measurements [5, 6]. Whichever way is used, it is extremely hard to obtain the traffic matrix for a large network. The link measurements which are related to traffic matrix is more realistic to be obtained in practice. Denote the link measurements by Y and the traffic matrix by X. Y is an n l by vector and X is n p by vector where n l << n p. Thus, the relationship between link measurements and the traffic matrix is represented by Y = AX where A is The corresponding author is Hong Shen. 5 Probability-Model based Network Traffic Matrix Estimation 33 Again, for simplicity in comparison, we denote this by Min method. In Min method, L norm is not easy to write in the form of quadratic X and using derivative, we solve the problem of Minimize g(x) = X X p, s.t. Y = AX, and construct the Lagrangian function as follows. Thus, L(X, λ) = X X p + λ AX Y (8) L(X, λ) = λx T A T AX + λy T Y λy T AX + X T X X T X p + X T p X p (9) The Karush-Kuhn-Tucker conditions for this local minimum are given as follows. L(X, λ) X 0, (0) L(X, λ) λ = 0, () L(X, λ) X = 0, () λ L(X, λ) λ = 0, (3) λ and X 0, λ 0. 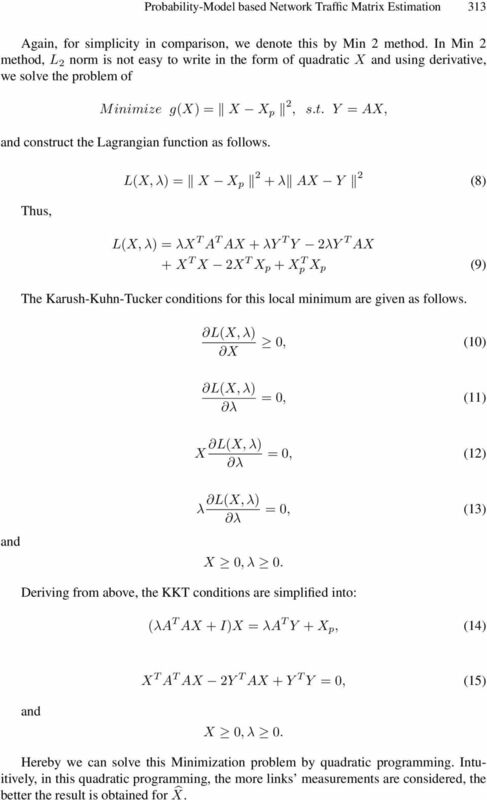 Deriving from above, the KKT conditions are simplified into: (λa T AX + I)X = λa T Y + X p, (4) X T A T AX Y T AX + Y T Y = 0, (5) and X 0, λ 0. Hereby we can solve this Minimization problem by quadratic programming. Intuitively, in this quadratic programming, the more links measurements are considered, the better the result is obtained for X. 12 30 Hui Tian et al. 5. 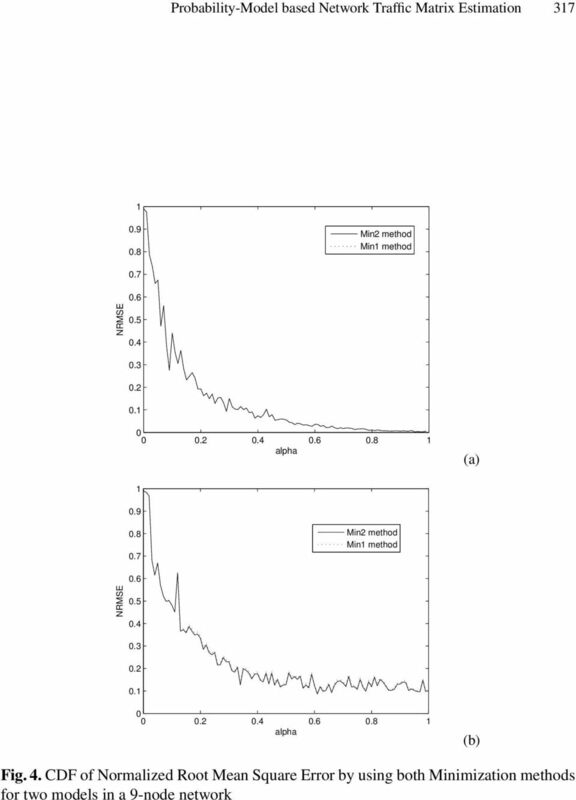 Zhang, Y., Roughan, M., Duffield, N., Greenberg, A.: Fast accurate computation of large-scale ip traffic matrices from link loads. In: Proc. of ACM SIGMETRICS. pp San Diego, California (Jun 003) 6. Zhang, Y., Roughan, M., Lund, C., Donoho, D.: An information-theoretic approach to traffic matrix estimation. In: ACM SIGCOMM. pp Karlsruhe, Germany (Aug 003) 7. 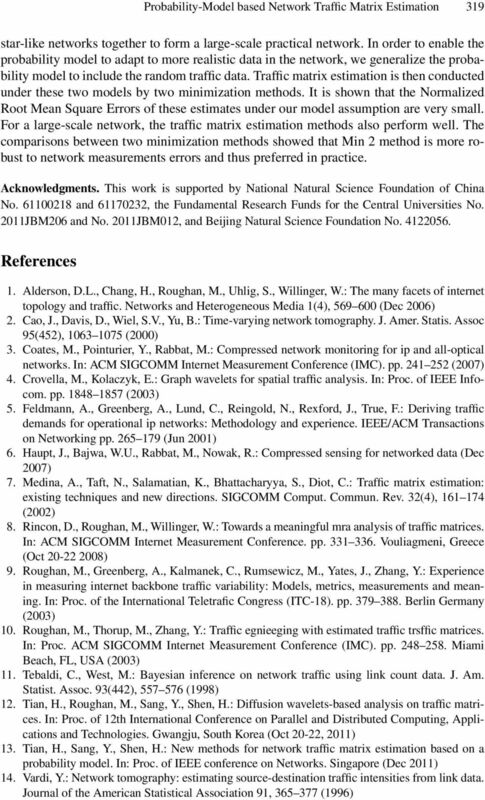 Zhang, Y., Roughan, M., Willinger, W., Qiu, L.: Spatio-temporal compressive sensing and internet traffic matrices. In: Proc. of ACM Sigcomm. pp Barcellona (August 009) Hui Tian received B. Eng. and M. Eng. degrees from Xidian University, China and Ph.D. from Japan Advanced Institute of Science and Technology, Japan with full-scholarship supported, and awarded Excellent Ph.D Gradulate. She worked in Manchester Metropolitan University as a lecturer, and University of Adelaide as a research fellow. She is now an associate professor in Beijing Jiaotong University. Her main research interests include wireless communications and networking, Network Tomography and performance evaluation. Yingpeng Sang received the BS degree in computer science from Southwest Jiaotong University, China, in 00MS degree in computer science from Institute of Mobile Communications, Southwest Jiaotong University, in 004, and PhD degree in computer science from Japan Advance Institute of Science and Technology, in 007. He is currently an associate professor in Beijing Jiaotong University. His research interests include privacypreserving problems in databases, data mining and other networking scenarios. 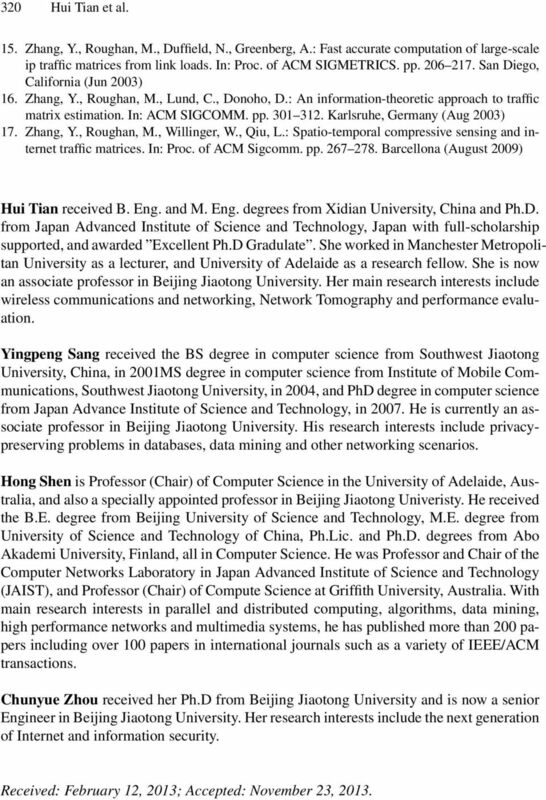 Hong Shen is Professor (Chair) of Computer Science in the University of Adelaide, Australia, and also a specially appointed professor in Beijing Jiaotong Univeristy. He received the B.E. degree from Beijing University of Science and Technology, M.E. degree from University of Science and Technology of China, Ph.Lic. and Ph.D. degrees from Abo Akademi University, Finland, all in Computer Science. He was Professor and Chair of the Computer Networks Laboratory in Japan Advanced Institute of Science and Technology (JAIST), and Professor (Chair) of Compute Science at Griffith University, Australia. With main research interests in parallel and distributed computing, algorithms, data mining, high performance networks and multimedia systems, he has published more than 00 papers including over 00 papers in international journals such as a variety of IEEE/ACM transactions. Chunyue Zhou received her Ph.D from Beijing Jiaotong University and is now a senior Engineer in Beijing Jiaotong University. Her research interests include the next generation of Internet and information security. Received: February, 03; Accepted: November 3, 03. On the Impact of Route Monitor Selection Ying Zhang Zheng Zhang Z. Morley Mao Y. Charlie Hu Bruce M. Maggs Univ. of Michigan Purdue Univ. Univ. of Michigan Purdue Univ. Carnegie Mellon and Akamai Tech. GIS DRIVEN URBAN TRAFFIC ANALYSIS BASED ON ONTOLOGY Tazin Malgundkar 1,Madhuri Rao 2 and Dr. S.S. Mantha 3 1 Student, Computer Engineering, Thadomal Shahani Engineering College, Bandra, Mumbai, India.